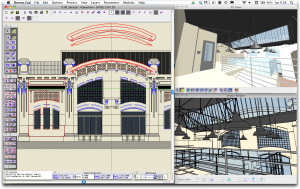 The new version of Domus.Cad is out – and it’s called Domus.Cad Pro. No more numbers – we had reached version 16 – we’re starting at 1 of Domus.Cad Pro, where Pro stands for Professional, as opposed to the version Std (Standard), also being released. Lots of new features that make Domus.Cad increasingly the best professional architecture and parametric program for architects worldwide. Lots of new features in the 3D vectorial view. Among other things we have added all standard 3D views, such as isometric and diametric oblique axonometry with the possibility of generating any standard or custom view parametrically. The previous types of axonometric view are, of course, still there – perspective, parallel, cutaway and section. The graphic interface has been modified to accommodate current high-resolution monitors, by modifying some palettes, management of popup menus and new ways of navigating in plan and 3D view. Not only can PDF documents be imported and visualized with their original vectorial aspect – now multi-page PDFs can be viewed page-by-page and you can decide which page to visualize or print (Mac Os only). Now you can visualize the measurements in 3D vectorial view too, while the distance is visualized constantly in a tool tip by the cursor, in addition of course to all the information in the message palette. Objects selected are visualized with a semi-transparent background and additional functions for modifying them. Right-clicking the mouse brings up a menu with the functions that can be carried out in that context . DWG and DXF support from 12 to 2012, with excellent support of various graphic elements. If you happen to be working with Italy you will probably need to send your plans to DOCFA (the Italian Land Register program). Domus.Cad Pro is a total BIM solution, without compromise, also available with the exclusive Rent-to-Buy formula. Pingback: Interstudio News - Standard and Professional – Domus.Cad now twice as good!